It’s no secret to anyone who visits my home or business that I love equestrian decor. Even so, I used to be surprised when my birthday rolled around each year and casual friends seemed to always think the perfect gift for me was a picture or painting of a horse. It made logical sense, I suppose, but for me, equestrian decor is a more nuanced style than it is the adhesion of images of horses to my walls. Equestrian style is not all tartan plaids and dark wood paneling and old prints of dead horses. Modern equestrian style is both an ever-cycling trend and a never-out-of-fashion classic. Always stylish in some contexts, equestrian themes and motifs tend to reemerge every few years in popular home and fashion design. Whether you are a trend setter, a trend follower, or a true equestrian with an appreciation for the warm tones and classic styles of equestrian decor, it’s my hope that this collection of equestrian decor from my equestrian estate in Missouri (plus a few outside influences) will inspire your own experimentation with inviting utilitarian equestrian items into unique decorative vignettes. 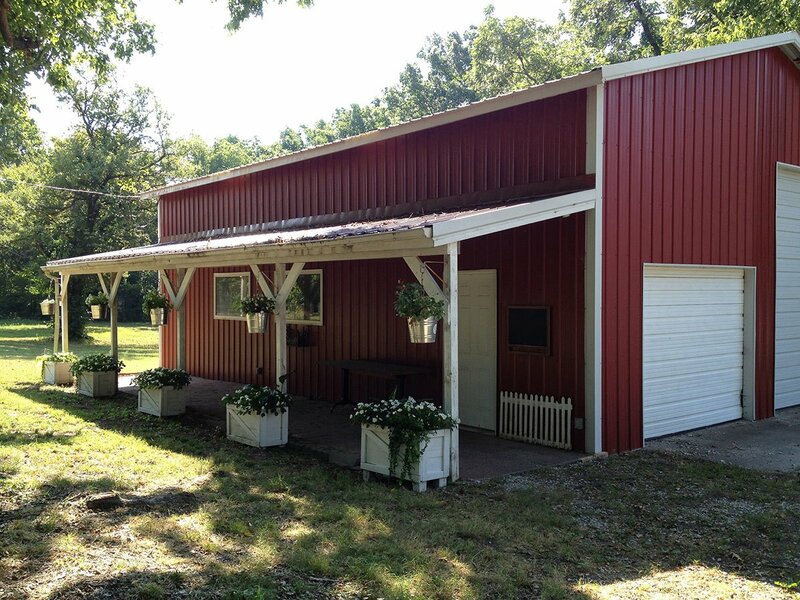 In 2010 I purchased a property, home and stable, that had previously housed a riding stable and horse boarding farm. Although I used the property primarily for my home and business and only kept one or two horses as a hobby during that time, as a tack store owner I loved emphasizing equestrian decor. Below I have included a few of my favorite equestrian decor elements, ideas, and arrangements from my home and grounds around Hawk Hill. A few basic pieces can help you rework your equestrian design elements through the seasons and from year to year. Many of these items can be scrounged from your own tack trunk if you or someone you know is a practicing equestrian. As I became increasingly interested in equestrian decor, I found my decorating interests informing how I shopped for new tack for my horses. I discovered that purchasing mid-to-high-end quality supplies in traditional styles and colors resulted in a classic look in my barn, and after a few months or years of use in the barn, resulted in cool used items that, because they were manufactured in traditional styles and weathered by authentic use, looked like vintage supplies from a bygone age. This equestrian mantle decor uses a display of 3 trophy cups (A hint for the eBay inclined among us: these are often called “loving cups” – after their original use in weddings) that are a combination of actual vintage trophy cups and a stylized modern version of a trophy cup Target released a few years ago. (These were a seasonal item at Target, but you can find similar items at Amazon with this unique string of search terms) These trophy cups are staggered in height in order to increase visual interest. I staggered their heights by using vintage books with equestrian themed titles as risers. The vignette is completed using me carefully arranged set of English stirrup irons and black stirrup leathers. The addition of stirrups- with attached leather straps- helps create a horizontal reach to an otherwise vertical display of trophy cups. My living room at Hawk Hill features a Wythe Blue wall color with grey painted brick fireplace. Gold and silver tones blended well in this room, in my opinion, despite conventional wisdom to use only one. In the background of this image, you can see a functional but decorative chandelier added to the room. See my tutorial on adding a chandelier to a ceiling without an installed electrical wiring box. Displaying Horse Show Trophies: This can be a tough task to do stylishly. 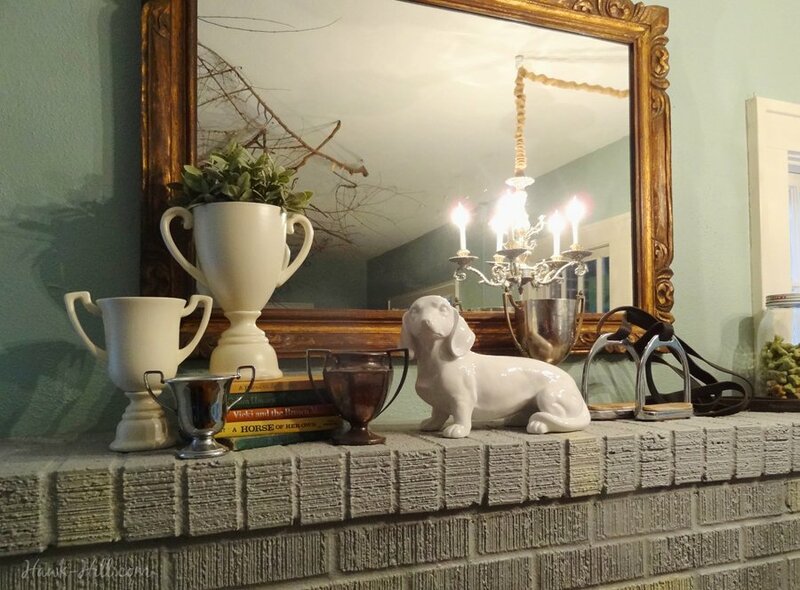 When I downsized from 3,000 square feet to 300 square feet, my horse show trophies were among the first belongings tossed overboard, but I’d always kind of wondered if a few trophies painted a solid, glossy white could make a stylish addition to a mantle display like this one. This framed horse shoe is an actual horseshoe that my dressage horse wore during one of our biggest shows. I painted the horseshoe gold and added antiquing- which added lowlights to the natural scuffs, pits, and scratches left from being used during competitive riding and from the process of rusting prior to refinishing. 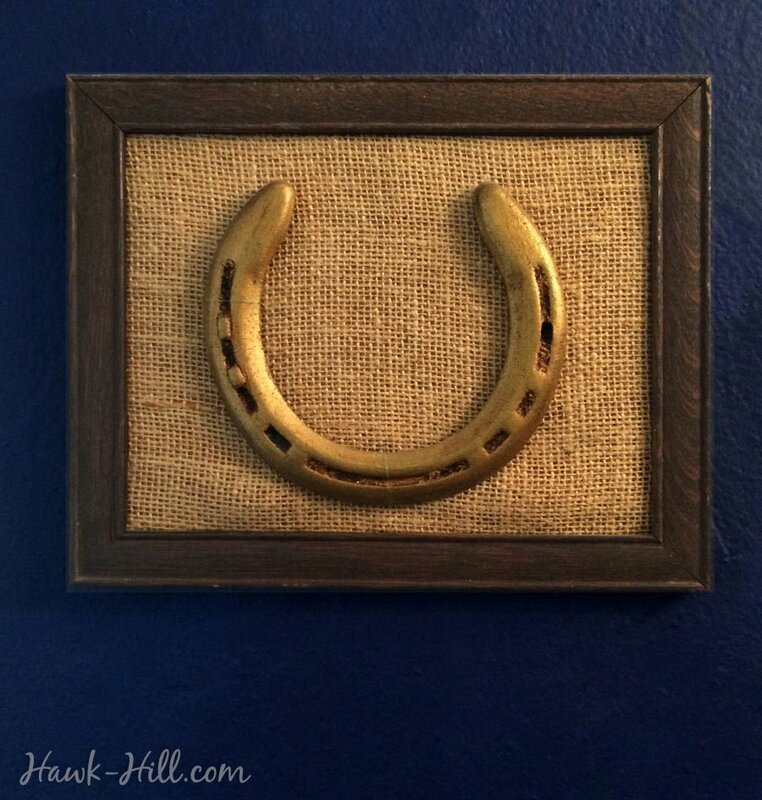 See my tutorial on preserving keepsake horse shoes by clicking here. Every rider has multiple horse bits that, while “the perfect bit” at the time, end up unused and abandoned. These bits can be combined with snap hooks or carabiners to function as wreath hangers in the winter and hanging basket holders in the summer. I’ve talked about the difference between equestrian “decor” and equestrian “themes,” and for me that usually means the exclusion of framed horse art, but this framed equestrian print definitely counts as an exception. Not only because it’s different, but because it has deep sentimental meaning for me, and a classic shape. You might not think of horse blankets for decor, but a traditional warm plaid wool cooler with brass surcingle fittings can be folded and displayed elegantly in an equestrian vignette. *when spring cleaning demands you throw out broken and ugly old tack and equestrian items, try to save the hardware. 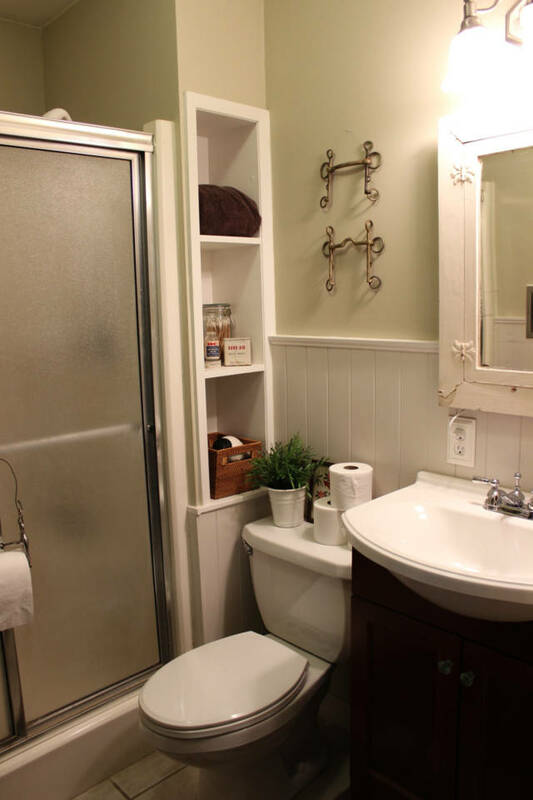 Not only will it come in handy for projects like this, but very often can save you lots of cash on repairs. 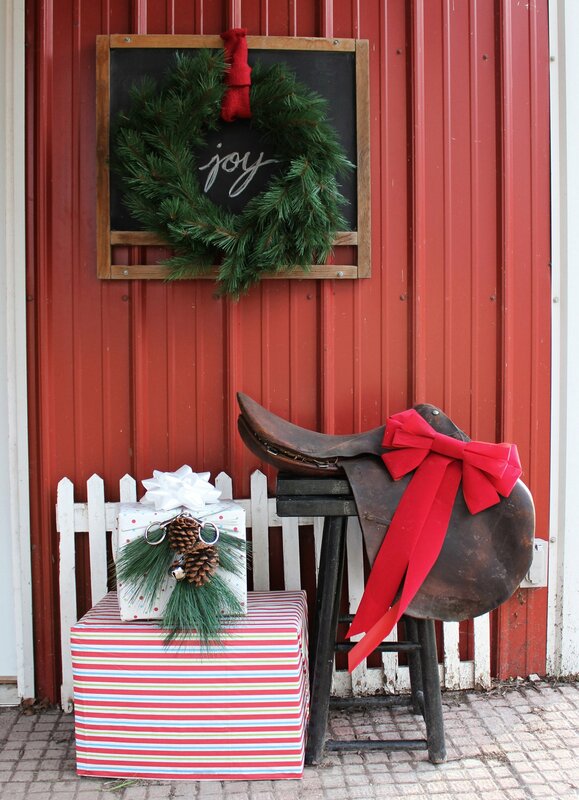 One of my favorite equestrian elements to decorate with are riding boots. I’m speaking specifically of tall English riding dress boots, but cowboy boots can also make a stylish decoration with a western feel. Tall boots usually need to be modified to be used for displays- because the tendency of tall boots to wrinkle and sag at the ankles. 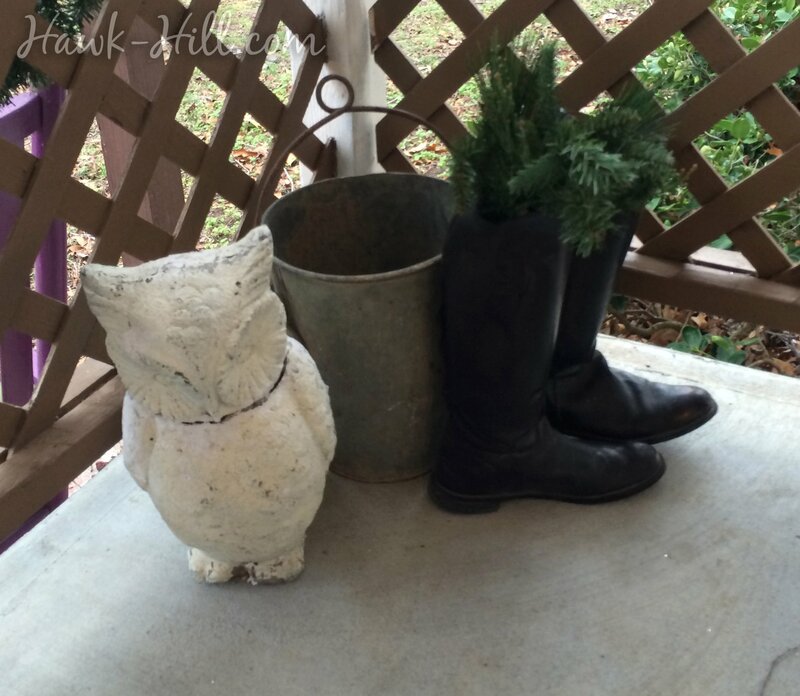 (Because of this, rubber boots styled in the equestrian fashion – usually for entry level young riders – actually work better for decor, in my experience). Keep in mind that boots used in displays outdoors, winter or summer, may end up home to unwelcome creatures. One way to deal with both the sagging and the insect/snake issue is to fill the boots with either wet cement or plaster to fill the void and help the boots keep their shape. I love hunt caps, but I think they are actually rather difficult to decorate with. Above I’ve included one example of how I ultimately ended up displaying my hunt cap collection- admittedly, not my favorite display, I was always looking to redo this room and change this equestrian helmet decoration. Unfortunately, I made my big move to Seattle before I had the chance and sold my hunt cap collection in the transition. These hunt caps are displayed atop quart sized mason jars- which work perfectly to just-slightly lift the cap up off the delicate velvet edges. This photo shows my display of equestrian hunt-caps. 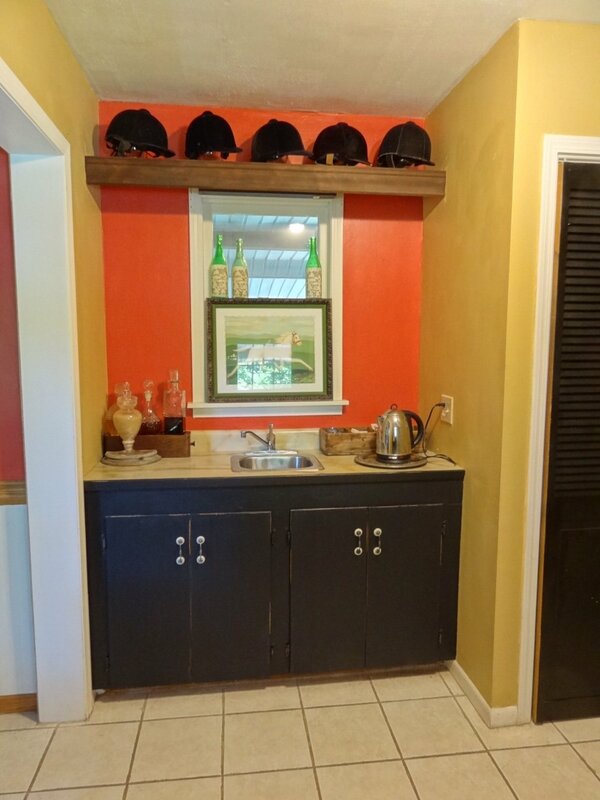 I never got around to remodeling this wet bar to a mud room with the white subway tile and white farmhouse sink I dreamed of. In this room, I’ve displayed my collection of hunt caps on a high shelf. My favorite, and most defining, element of mequestrian decor on the porch of my tack store was an old saddle. I used a gorgeous vintage Crosby hunt-seat saddle, but almost any saddle will work. This old Crosby was afflicted with a broken tree. Typically, a broken tree means a saddle is destined for the trash (but often means they can be purchased for a song or nabbed from the garbage when thrown out) but this lovely old patinaed saddle worked for years as a beautiful piece of decor. Old saddles with broken trees, because of their unsuitability for riding, make great decor items. This particular saddle was stored outdoors as decoration in both winter and summer. The leather aged noticeably during the 5 years I used this saddle for outdoor display, but protection from direct rain and direct sunlight (by displaying on a covered porch area of my barn) prolonged the leather much longer than I expected. To clean and preserve, I’d hose the saddle down a few times a year to rinse off dust and pollen, and once a year I would clean thoroughly with saddle soap, allow to dry completely, and then recondition. Reconditioning/Oiling the leather helped prevent the leather from becoming brittle and helped the leather resist and repel leather. 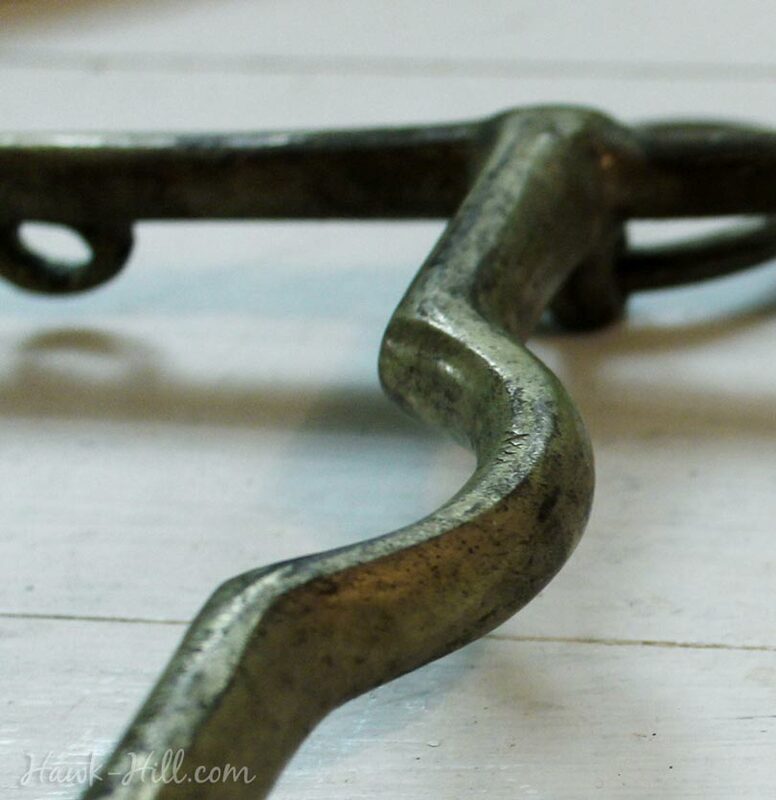 Old horse bits, like many vintage metal elements, make fascinating wall art. This photo shows my display of two vintage brass pelham bits. You could certainly use new bits for this process but the patina of vintage bits is particularly beautiful, in my opinion. Most bits today are constructed of steel, but chemically the makeup of brass prevents rust, which means it’s far easier to score vintage bits with interesting patina rather than a dull rust. Sometimes I explain this nuanced difference as the difference between being “themed” and “inspired.” – It may help to think of it like the difference between a princess “themed” party and a princess “inspired” wedding. The former includes icons and archetypes of princesses: tiaras, dresses, cups and plates pronouncing the theme, and probably a cake bearing the likeness of a Disney princess. The latter, however, is more subtle. To plan a wedding “inspired” by an image of princess doesn’t mean you’ll liberally decorate the venue with images of princesses, but rather, you’ll set a theme using color, texture, and archetypal objects (diamonds, a traditional gown, opulent ceremony, and perhaps a departure by horse drawn carriage or chauffeured vehicle). This is the difference between the poster-plastered “horse themed” bedrooms of my childhood and the more sophisticated “equestrian inspired” decor of my home as an adult. I have lots more ideas and images for using equestrian elements to create decor. I’ll post more in a few days, in the meantime, what are YOUR favorite methods for equestrian inspired home and garden design?